We’ve been hearing about the ASUS Eee Pad MeMo for around a year now - it was first unveiled at CES last year, but since then it underwent a couple of transformations. 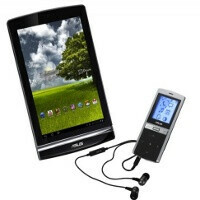 The slate was planned to launch with Honeycomb, then Asus decided to add 3D and a stylus, and finally, it seems, they just kept the design and are now planning to release the 7-inch MeMo sans 3D and on Android 4.0 Ice Cream Sandwich. At least that’s the initial plan, but our guess is that the main priority over at Asus is first delivering ICS ot the Transformer Prime. What’s even better is that the release date is pretty soon - January 2012. Asus is bundling the tablet with a MeMic Bluetooth companion device that allows you to make calls or be used as a remote or to listen to music which seems like a neat little idea. Reportedly, Asus will ship the new tablet through carriers, but we still have no news about the actual hardware that will power the slate. The Asus Transformer Prime is set to make a big US debut on December 19th with the quad-core NVIDIA Tegra 3 chip and we wouldn’t rule out the possibility of the Eee Pad Memo to also come with it.